[The people in the crowd] replied, "We want to perform God's works, too. What should we do?" Jesus told them, "This is the only work God wants from you: Believe in the one he has sent." 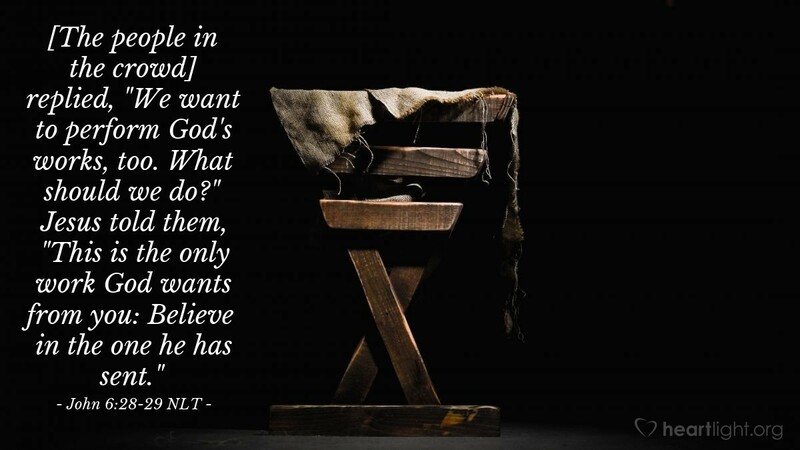 What does God want us to do? What is the work that endures to eternal life? What matters most in the scope of all other things? Believe that God sent Jesus to be our Savior. Dear God, my Father, please stir me to live with my faith in Jesus as THE most important thing in my life. Help me properly discern what is important. Help me integrate everything into my life based on my relationship with Jesus. May Jesus be the center of my life, my hope, and my faith. Amen.